I surprised my daughter while we were in Florida with this cake. We were planning a trip to Disney World the next day so I thought a Disney Princess Castle cake would be the perfect birthday cake. She was so excited! For this cake I used the Wilton Romantic Castle Cake Set. I followed the directions with the set but in a nutshell: I used a 10″ and 6″ round cakes decorated with butter cream I made 285 Forget me Nots in pink, yellow and purple. For the peaks I covered them in light blue butter cream and sprinkled them with Wilton clear cake sparkles. 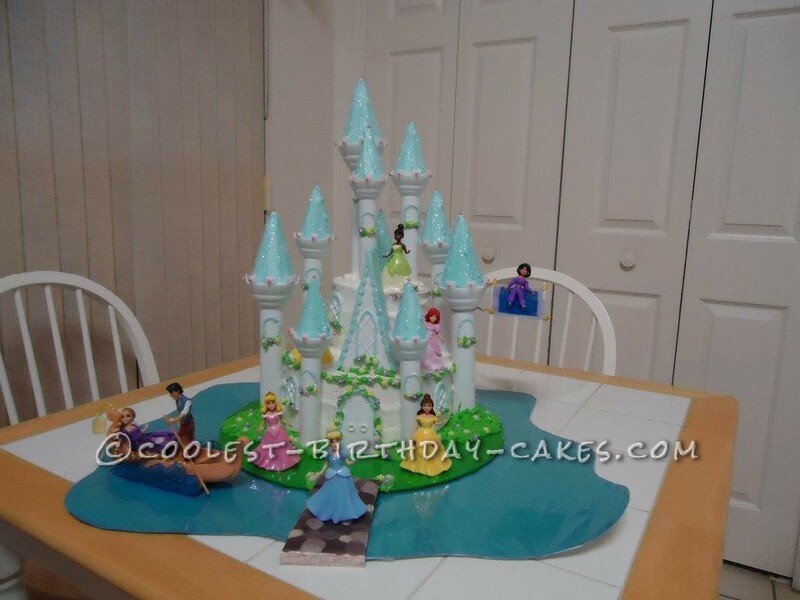 I used tip 233 to make grass and bushes around the bottom of the castle, tip 349 to pipe leaves around the windows, doors and top of the 10″ cake. I then added the flowers. I bought the princesses at Target, they came together in a set and the Tangled boat with Rapunzel and Flynn from Walmart. I made the magic carpet out of modeling chocolate and attached it the the side tower with wire for Jasmine to sit upon. I also used cardboard and modeling chocolate stones for a bridge for Cinderella. The water was cardboard covered in blue tissue paper and clear plastic. I didn’t find this cake to be difficult to create, but it was more time consuming that I had thought it would be.